Those who take an interest in recording wildlife sounds be they insects, birds, frogs or environmental sounds be informed that the next field workshop will be held in north Queensland. This is the first time the group has met in the far north. Other meetings have been held in New South Wales, Victoria and Western Australia. The get-together combines presentations, field recording and demonstrations of the latest recording and analytical gear. This year the confab will be from 15-20 October 2013 at the Kingfisher Lodge, Julatten, Queensland. Bookings can be made by contacting the lodge or fred van Gessel . The Kingfisher Lodge is an ideal place for such a meeting. It is at the gateway to Mt Lewis road which will take you through all the life zones to nearly the top of the mountain where lichen-covered and orchid laden trees make it seem like you are in a botanical garden. Accompanying all this is a magnificent fauna. In addition, the Julatten is not far from open woodland and grassland habitats where an entirely different fauna can be observed. The Mareeba Wetlands offers opportunities to record a variety of wildlife from a very different habitat. Julatten is also the gateway to the Cape York Peninsula. The AWSRG is composed of members mostly from Australia with a wide range of recording experience in wildlife sounds. Non-professional sound recordists are most welcome and can gain valuable tips from those that spend a lot of time making sound records of Australian wildlife. The AWSRG publishes a journal and a CD of sound recordings at least twice a year. The journal includes latest recording and analytical gear with hints on use and costs. So a good opportunity for locals and Aussies from the Deep South to get together and exchange ideas and techniques for nature sound recording. Guinea Grass, Megathyrsus maximus, preferred name Green Panic, is everywhere in the Far North of Australia. it was introduced between 1865-69 at 22 locations by the Acclimatisation Society. Those folk thought they were improving the landscape with either better plants than were there in the first place or organisms from the Old Country with which they were familiar. Nowadays, we all wish they had had a different approach. European Starlings, Indian Mynahs,English and House Sparrows are a couple of introductions that would have been better left where they came from. Guinea Grass is a native of Africa. As a young grass it is fine fodder for cattle. But it soon grows to a height of 2-3.5 m and becomes tough and unpalatable to livestock. It quickly takes over and shades out native vegetation. It probably should be declared a weed but this is unlikely because of its use a green feed and silage for cattle. A recent trip to the Babinda area of coastal north Queensland provided a bit of a dilemma. After dark an array of local insects were discovered feeding on the seeds of the grass. 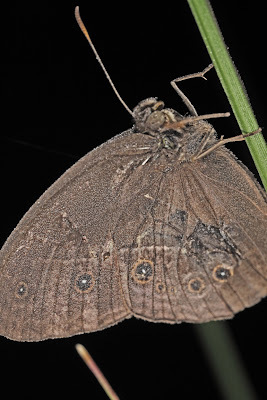 I suspect that a visit a few weeks prior would have found other insects feeding on the pollen and developing panicles. So as far as the insects are concerned, is this a detrimental plant? Is it helping insect populations or keeping them at abnormally high levels or is it substituting for the native plants that have been displaced by the Guinea Grass itself? 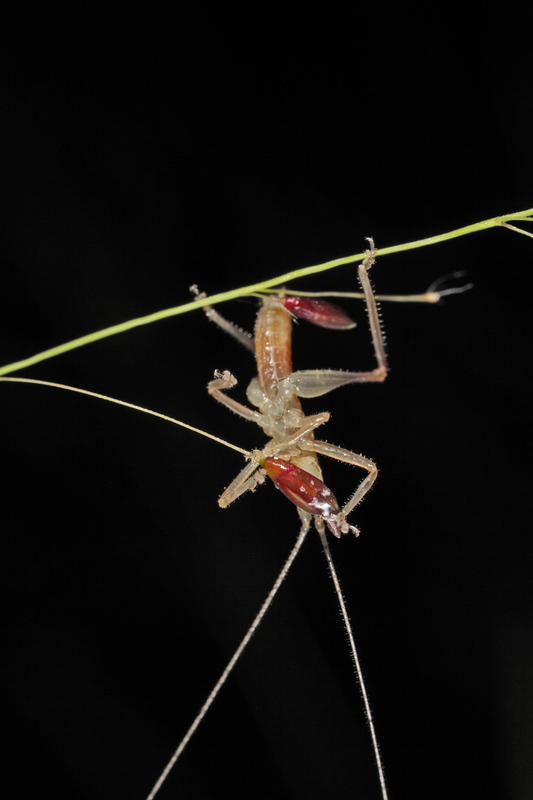 A young katydid (called a nymph) Tettigoniidae; Conocephalinae of the tribe Agraeciini, probably Goodangarkia prasinus (Karny) chewing on a seed. Same species enjoying (Buck) a grass seed after dark. Another member of the Conocephalinae, Conocephalus upoluensis (Karny), eating a seed. 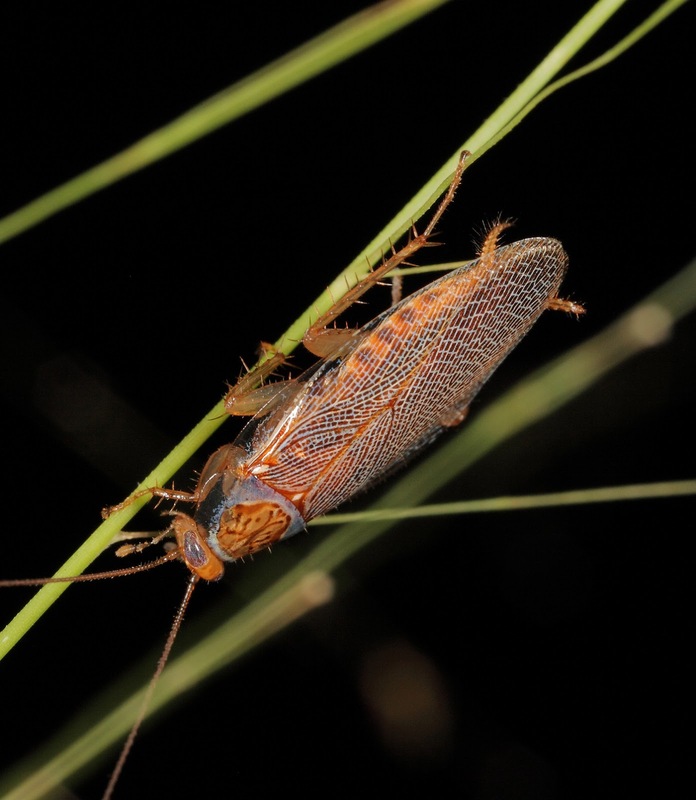 A native cockroach (Ectobiidae; Pseudophyllodromiinae), a nymph of Balta quadricaudata Hebard seeking a grass seed. 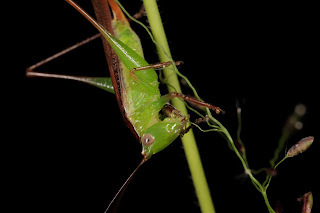 Adult male Balta quadricaudata Hebard in search of food. 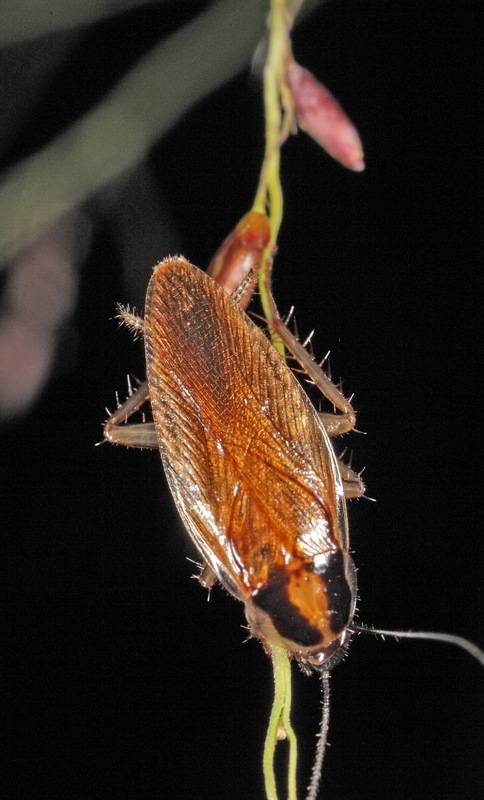 Many native cockroach species can be found, both day and night, atop grass stems feeding on pollen and seeds. 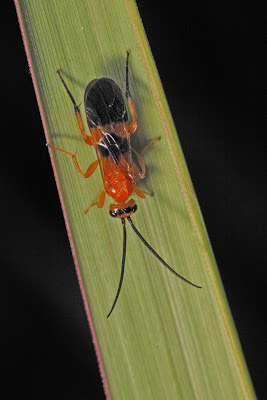 An undescribed species of Johnrehnia (Ectobiidae; Blattellinae) feeding on the same grass. 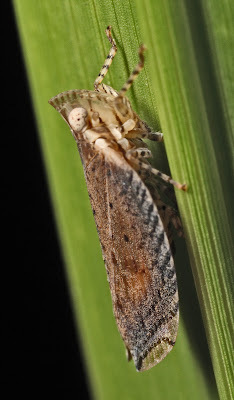 This species spends the day in leaf litter under trees and shrubs. Lophops saccharida (Kirkaldy), family Lophopidae, is a pest of sugarcane but it occurs in numbers on Guinea Grass. A caterpillar, probably Geometridae, feeding on Guinea Grass at night. 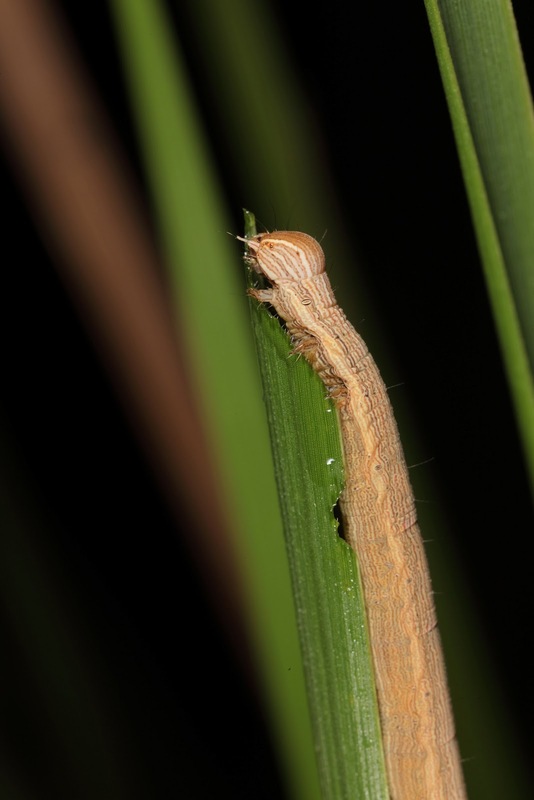 An Evening Brown caterpillar, Melanatis leda bankia, usually hidden during the day, emerges to feed under the cover of darkness. 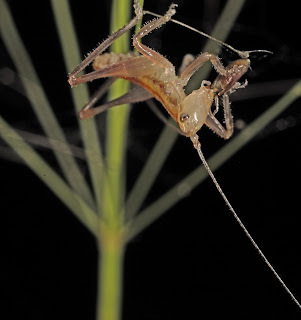 Many insects find Guinea Grass the place to spend the night. This is the Dingy Bush-brown, Mycalesis perseus. This braconid wasp was found in a folded leaf. And the predators find the grass to their advantage. 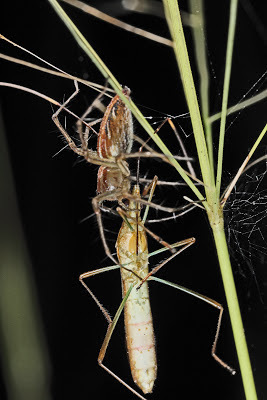 This spider is feeding on an alydid bug. These bugs are abundant in Guinea Grass. There is a project here for an enterprising student. 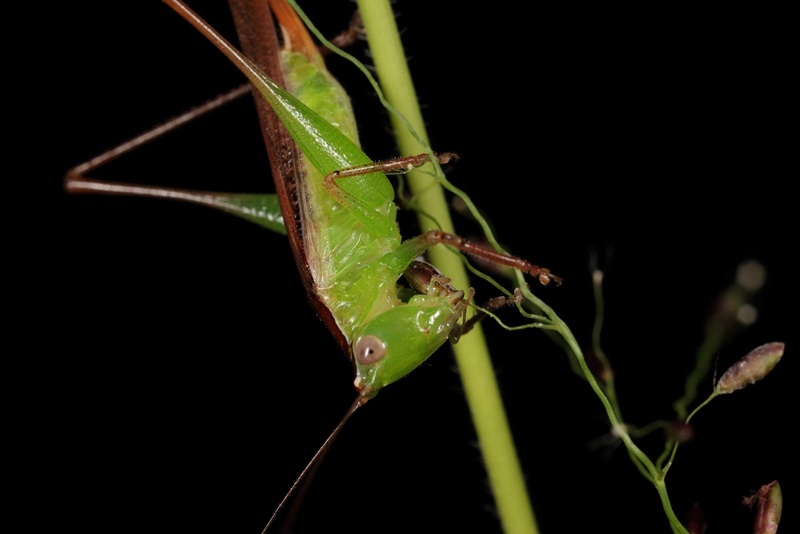 What effect is Guinea Grass having on the abundance of native and introduced insects? 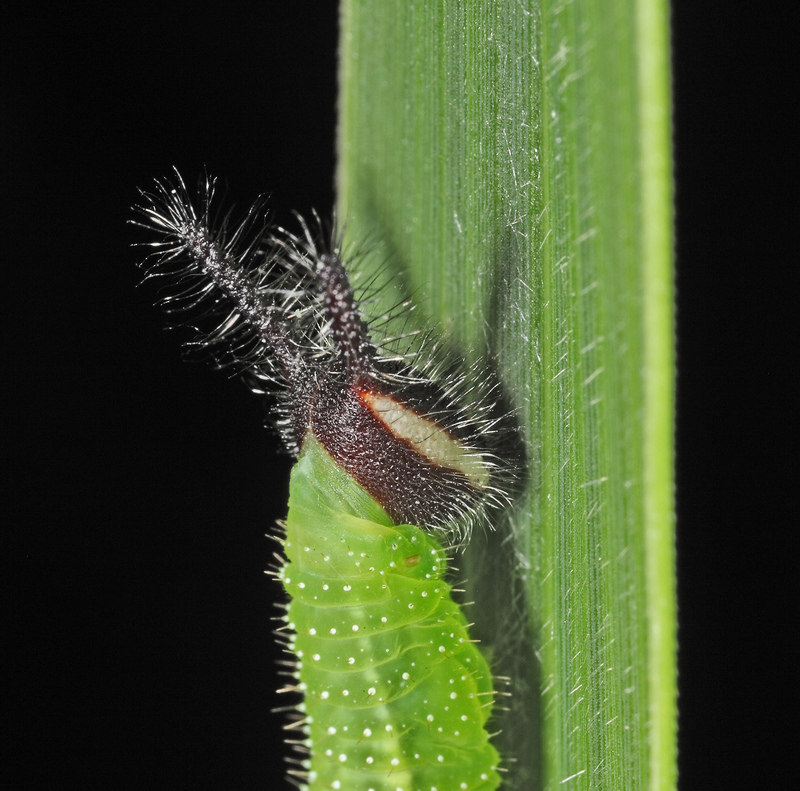 How important are native insects in keeping the grass under control? I recently met Lorraine Lemothe- an artist who uses insects in her work and who has used cockroaches in her artistic renderings. As luck would have it, she is about to have an exhibition. So if you want to see how cockroaches fit into the world or art, come along. The exhibition lasts for a month beginning in early July at the Tablelands Art Gallery, Atherton.